The most significant LASD school threat investigation was the February threat of a school shooting overheard by a security officer at El Camino High School in Whittier. The number of threats of violence reported at LA junior high and high school campuses increased by about 70 percent during the school year that ended this month. I-Team's Eric Leonard reports for the NBC4 News at 5 Friday, June 29, 2018. The number of threats of violence reported at LA junior high and high school campuses increased by about 70 percent during the school year that ended this month. Nearly one-quarter of all of the school threat reports in LA were made in the week following the murders of 14 students and three faculty members at Marjorie Stoneman Douglas High School in Parkland, Florida on Feb. 14, according to crime data provided by law enforcement. "The numbers come up, they come up very quickly, they spike, they frankly overwhelm all the agencies," said LA School Police Department Deputy Chief Jose Santome. NBC4's I-Team used crime report data to assemble the number of criminal threat reports, which were then sorted for junior high and high school campuses and compared with the previous school year. Map shows threats reported to police within the City of Los Angeles during the 2016/2017 and 2017/2018 school years. Not all incidents are shown as many LAUSD schools fall outside the city’s jurisdictional boundaries. Locations are approximate. LAPD and other statistics showed the number of teens arrested for making criminal threats also went up to at least 36, from about 14 in the 2016-2017 school year. LA County District Attorney Jackie Lacey says her office has filed more criminal charges in juvenile threat cases, though she's been working to reduce the number of juvenile criminal cases overall in recent years through alternatives to court and jail. "We are seeing an increase in filings by our juvenile office on 422s; 422s are labeled terrorists threats," she told NBC4. "We have a duty to protect the public by really looking seriously at these and looking at all of the facts and circumstances, and probably erring more on the side of caution and protection," she said. The LA County Sheriff's Department also reported a 2018 increase in campus violence threat reports for schools in its jurisdiction, though it could only provide data from the first of the year. More than half of the LASD's 103 threat reports were directed at junior high and high school campuses, and 13 of those cases led to arrests, according to LASD. During the 2016-2017 school year, LASD investigated about half as many cases. 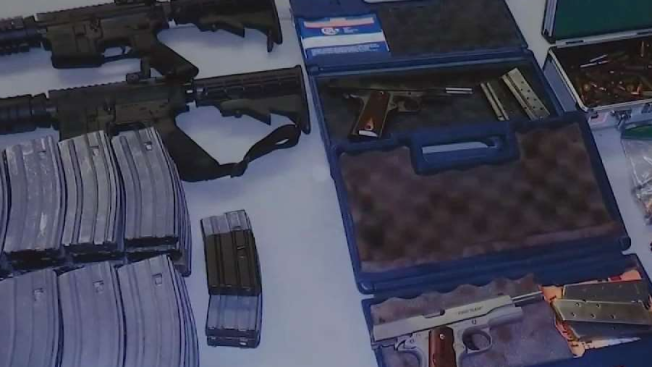 The student suspected of making the threats was arrested and deputies found two rifles and two handguns in the student's home, the Sheriff's Department said. That happened days after the murders in Parkland, Florida. Local police agencies said better methods of evaluating and investigating threats were developed in the weeks after the Stoneman murders in order to decide if students were in danger from a particular threat. The Los Angeles School Police Department that patrols LAUSD campuses expanded its working relationship with a law enforcement intelligence center, the FBI, and other police departments to coordinate the examination of each message, now described by police as, "mass school threats." "We take the exact language of the message, and put it into the context of who is the sender," Santome said. "In teenage vernacular -- 'is this a threat? Or does this have an alternate meaning?'"